Kona Launch 2016: NEW BIKES!!! 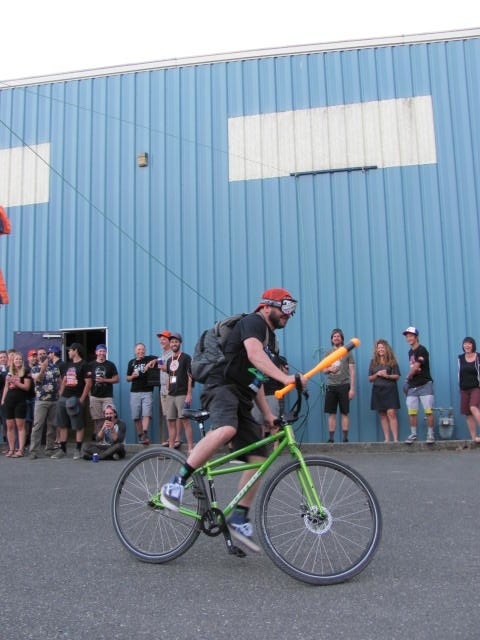 Kona sales rep Joe presiding over the blindfolded bike Piñata with a luchador mask and a megaphone for extra fun. Hello everyone, Aaron here. Last week I was lucky enough to be invited to Bellingham Washington, home of Kona bikes for their Kona Ride 2016 new product launch. Some of you might be asking yourselves what pray tell is a Kona Ride 2016 and why was Aaron so excited to attend such a function. Well, Kona Launch is the formal release of the new 2016 model year bikes where Kona has a big party and invites dealers from across the country and world to come out to their headquarters in Bellingham Washington to inspect and ride the new offerings so we can make informed decisions when buying and selling new bikes. So... basically I was out in Washington state right riding some gnarly bikes and hanging around with really weird and awesome bike people. Pretty cool. Kona Rep Nate posing in front of the demo set up. Now I've been working in the bike biz for the last 9 years or so. Almost 6 of those years full time so this was not my first dealer event. It was however the first Kona event I ever intended and let me say they do these events right. It's not uncommon to attend an event like this and spend most of your time in a conference room hearing about the minute details of each individual bike all the while wondering when you will actually be able to get out and take them for a ride. Invariably these events are held at great riding destinations making the sitting and listening all the more torturous knowing full well that great trails are so close yet demo rides are not scheduled till after more bad coffee and more semi interesting lectures about a 1mm difference in chain stay length blah blah blah blah blah. After the demo we went back to the hotel, got cleaned up and went to the Kona warehouse for a BBQ/party where we rode the pump track and played blindfolded bike piñata. The second day we were able to go out for a more intensive ride choosing one bike to really put through the ringer. I decided that I really should ride the new aluminum Honzo DL. The Honzo's introduction in 2012 was a pretty big deal, changing the way many looked at 29er hard tail geometry and capability. Since it's introduction numerous copies have hit the market (Trek Stache, Transition Transam, Canfield nimble nine to name a few) complete with slack head tubes, super short chain stays, and low bottom brackets. I myself got a Honzo this year and really really like it. The only thing I would change about the bike is it's robust weight (at 31lbs its really a porker for a hard tail). I was not the only Honzo rider loving the aggressive geometry but lamenting the weight so Kona answered our prayers with an all new aluminum frame saving a claimed 3 plus pounds just out of the frame alone. I'm happy to say the new bike is exactly what I had hoped. Same great aggressive handling characteristics with a noticeably lighter weight. We could also choose the type of ride (mountain, endure, road) and then the desired speed. To give you an idea the fast ride was led by pro MTB rider and Kona team manager Barry Wicks. I didn't feel like having a coronary trying to keep up with the leg shavers and chose a slightly slower but still invigorating mountain ride led be Kona rep Joe. We climbed 1500ft to the top of Gilbraith mountain and rode some of the best trails I've ever laid rubber to. The new lighter honzo helped me keep up with some of the fast guys yet not get dropped on the technical descents. It was truly one of the best rides of my life and I'll definitely be getting a new Honzo when they hit the warehouse later this month.